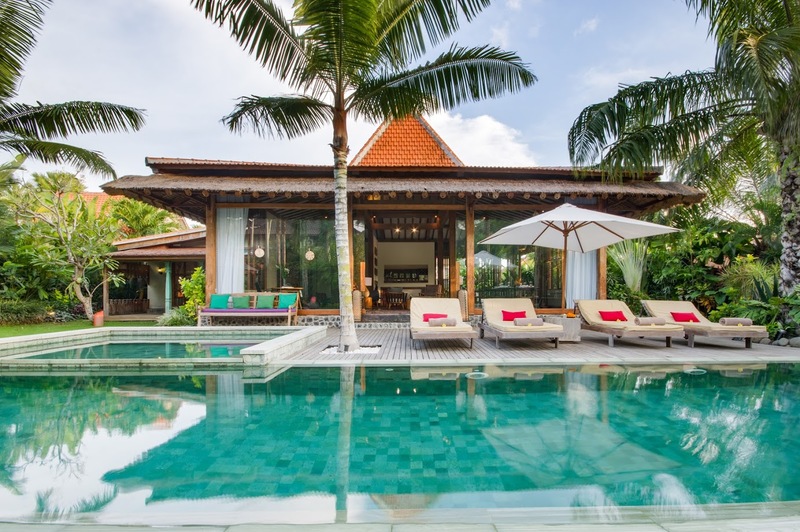 Near the village of Berawa, steps from Berawa beach, Villa Desa Roro Dua is a charming holiday home in Canggu, providing guests with a tranquil and serene ambiance to relax in and rejuvenate their senses. 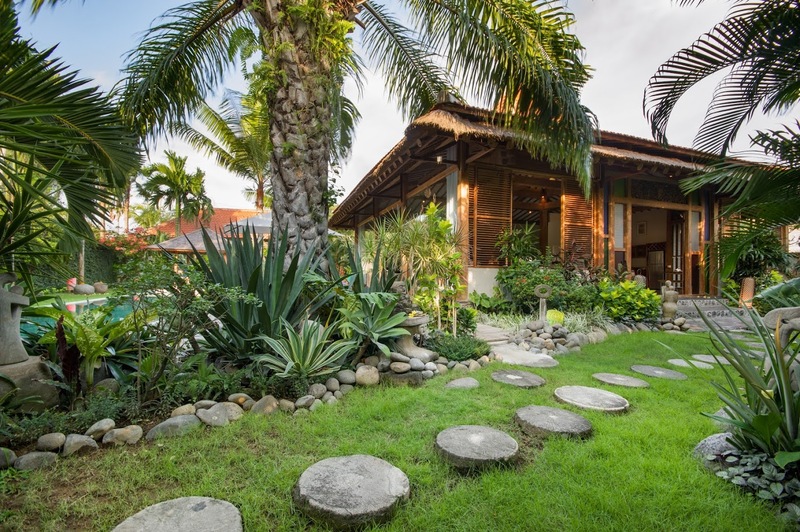 The luscious gardens and rich tropical foliage brings you a step closer to nature so you can finally breathe easy and enjoy with your friends and family. 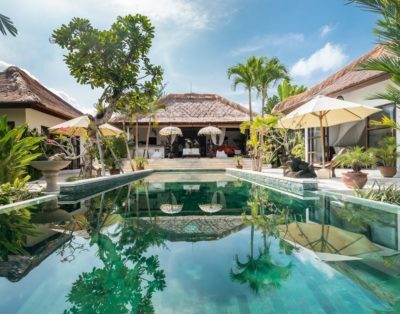 There is a lot that the villa has to offer including a glorious swimming pool, excellent living and dining spaces, spacious bedrooms and much more. 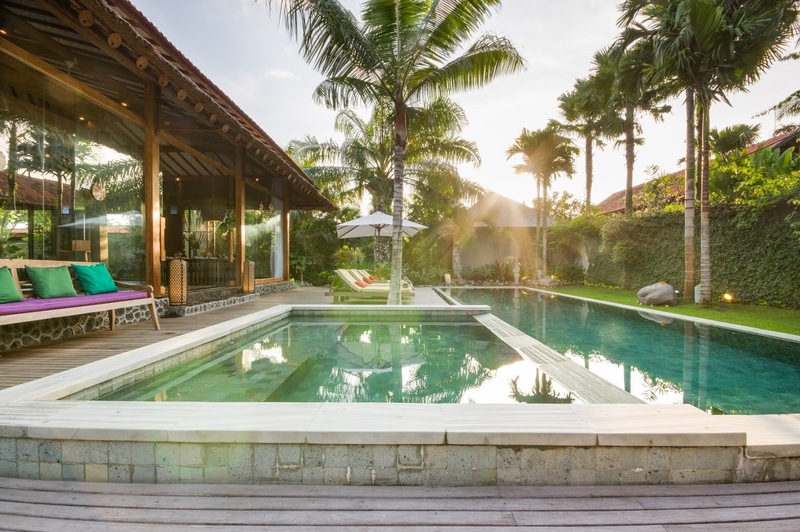 The magnificent outdoor gardens and swimming pool of Villa Desa Roro Dua is landscaped in a way that enhances the beauty of the natural greenery and the dense vegetation. 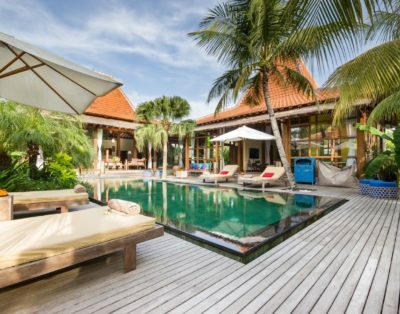 The 12-metre swimming pool that is connected to a lagoon where you can relax is snugly set amidst towering coconut trees and walled gardens. 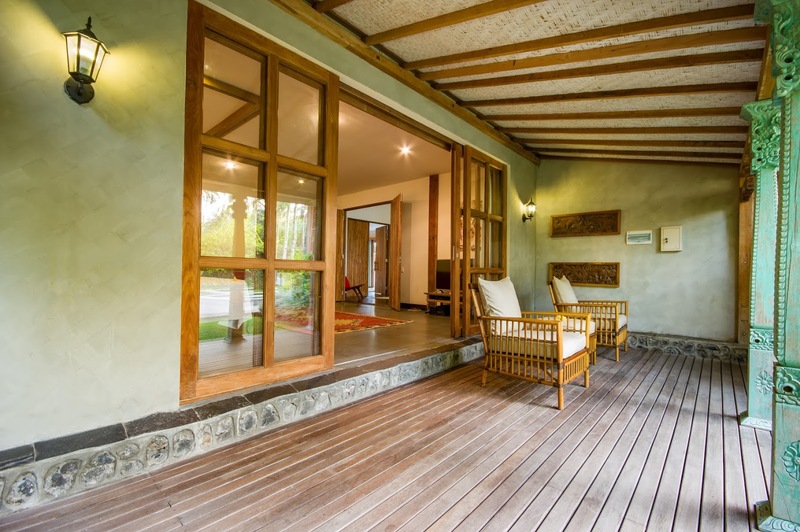 You can sunbathe on the deck loungers or read a book, with a chilled drink in hand. 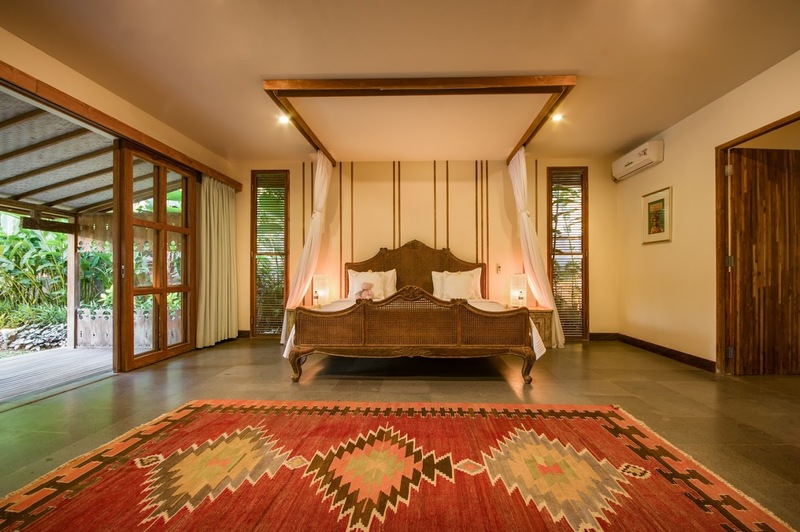 A traditional bale is home to a daybed, ideal for afternoon siestas or in-house massages arranges by the staff. 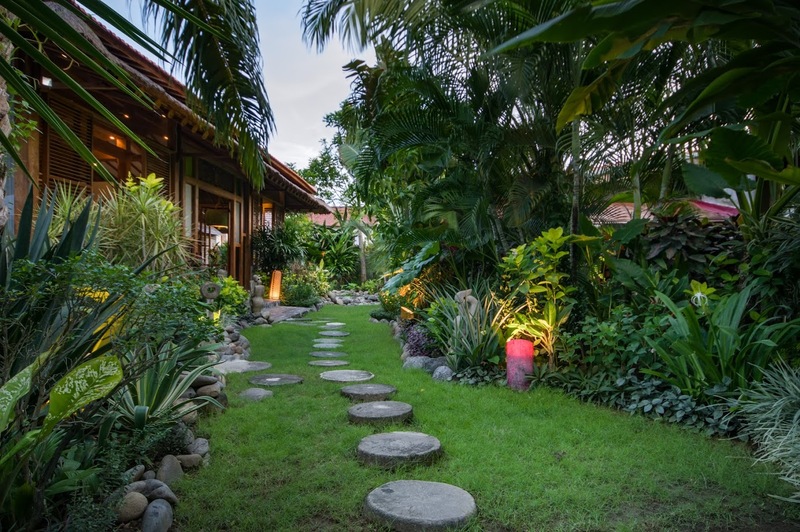 Behind the pool, you will discover the secret garden with abundant tropical foliage and a stone path leading up to the main living pavilion. 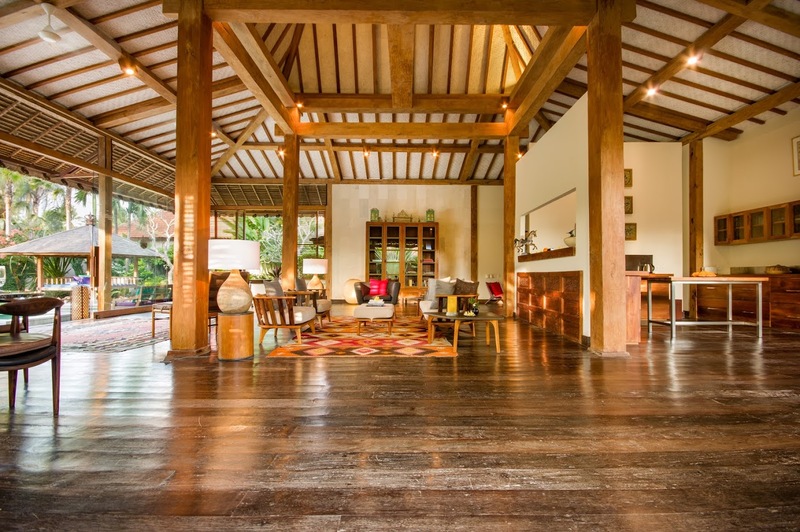 The stunning open-plan living area is right off the swimming pool and features a high-vaulted ceiling that is traditionally Balinese. 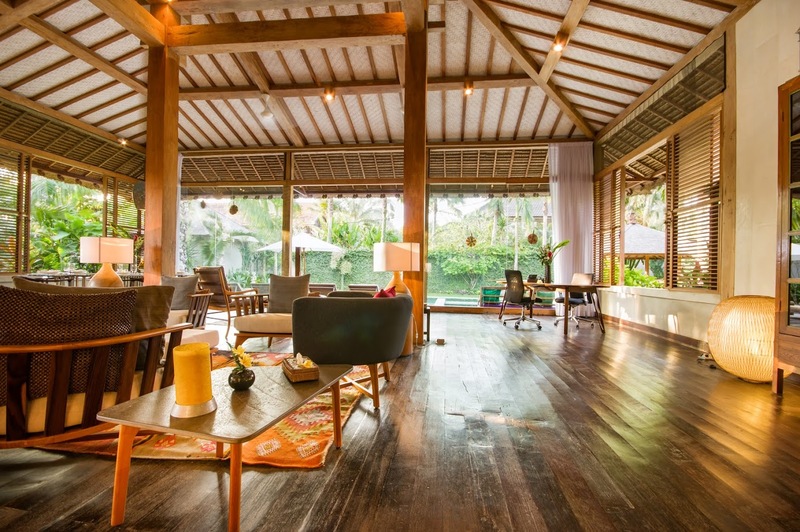 The room is furnished with wooden armchairs, lounge chairs, tables, cushioned chairs and sofas. 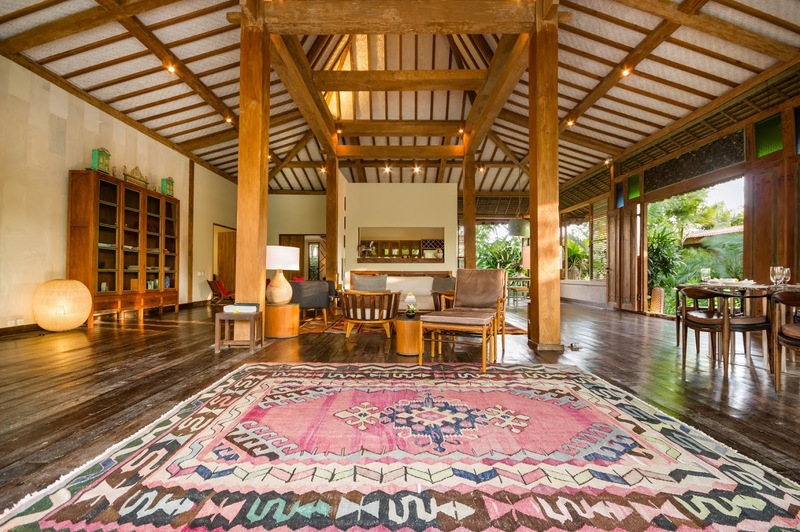 There are rugs and decorative artefacts that speak volumes of Balinese heritage and enable you to experience Balinese culture in the comforts of the villa. 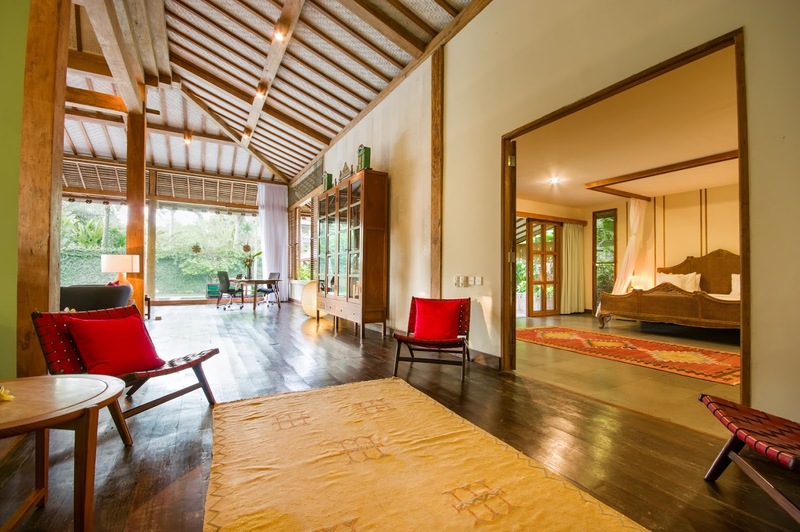 The spacious room is lounge-worthy as you can spread out and have a cozy time with your friends and family while the fresh breeze fills the room. 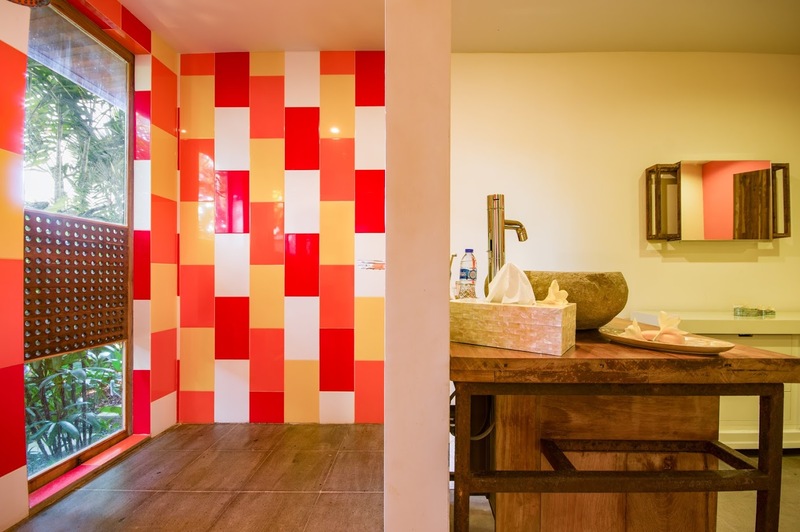 The room also features a working space as well as a dining area for four. 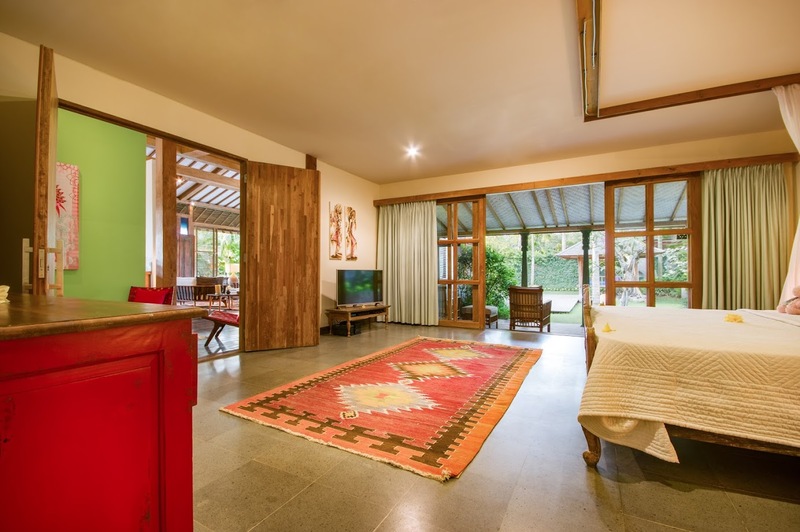 There are ample sitting areas around the room, that have low-floor chairs, rugs, floor sitting, and couches everywhere for a homely atmosphere. 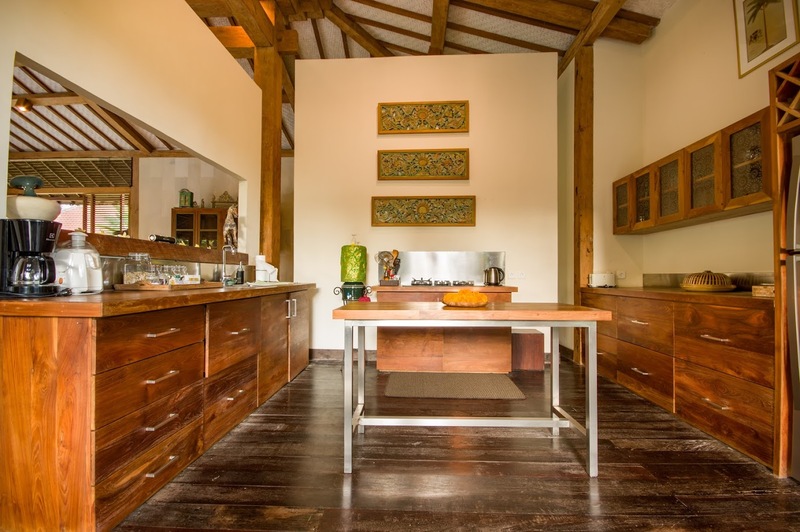 A traditional and fully-equipped kitchen is part of the living space and comes with everything you could possibly need to explore your culinary talents. 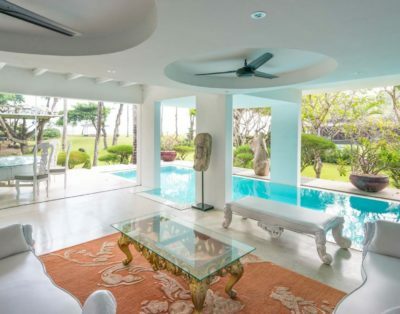 The open space and the large windows allow for cross-ventilation so the area remains cool and comfortable throughout the day. 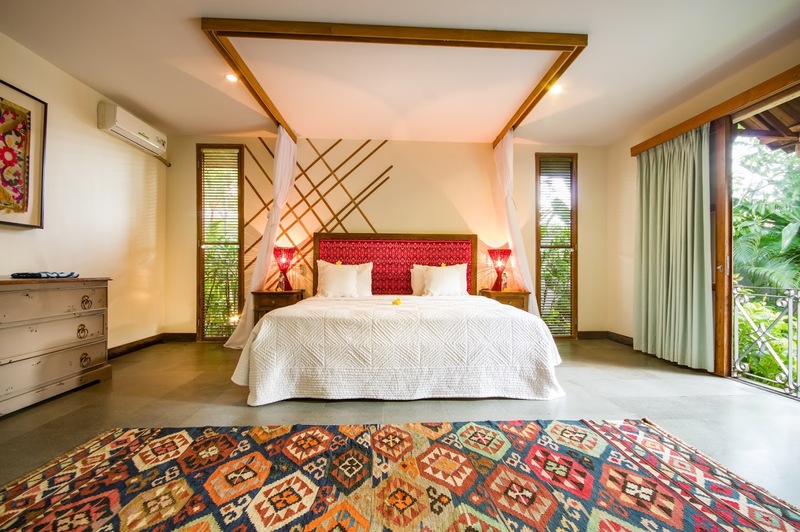 The romantic and comely design of Villa Desa Roro Dua comes across amazingly through its two, air-conditioned bedroom suites that are decorated with complete traditional attire. 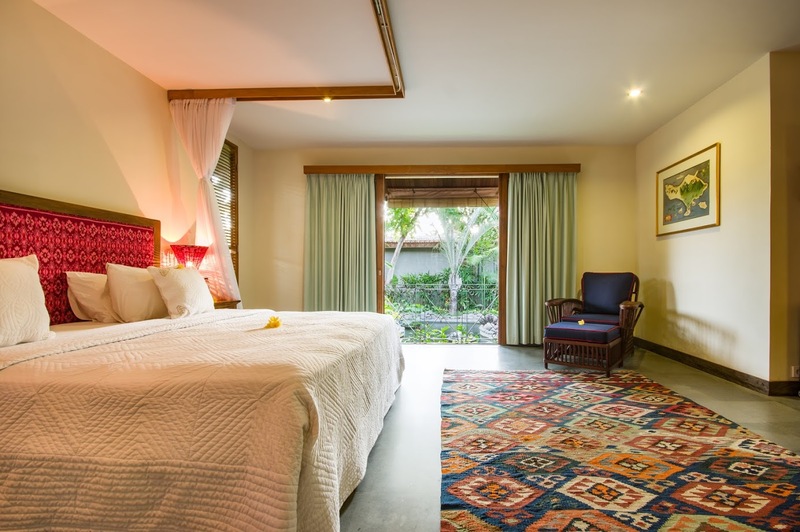 With colorful rugs, bright wall hangings, and vibrant artwork each bedroom is a sight to behold. 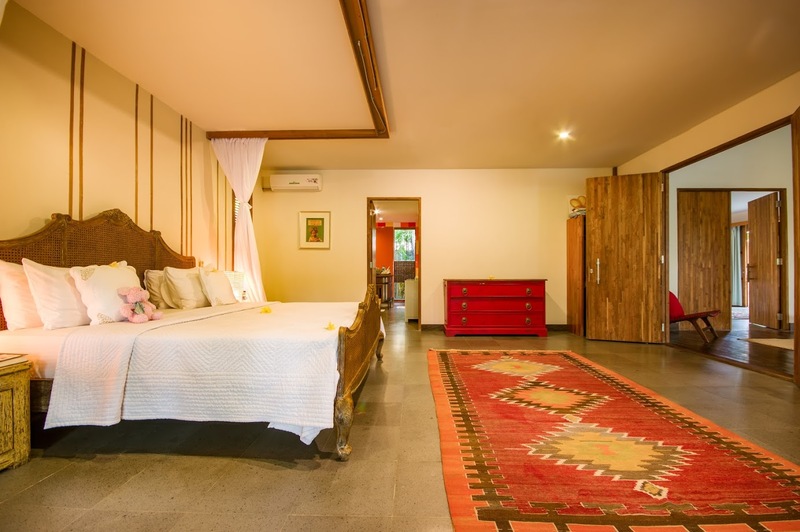 The king-sized beds are lavish and luxurious, perfect for a lie-in when you’re feeling lazy and would rather stay indoors. 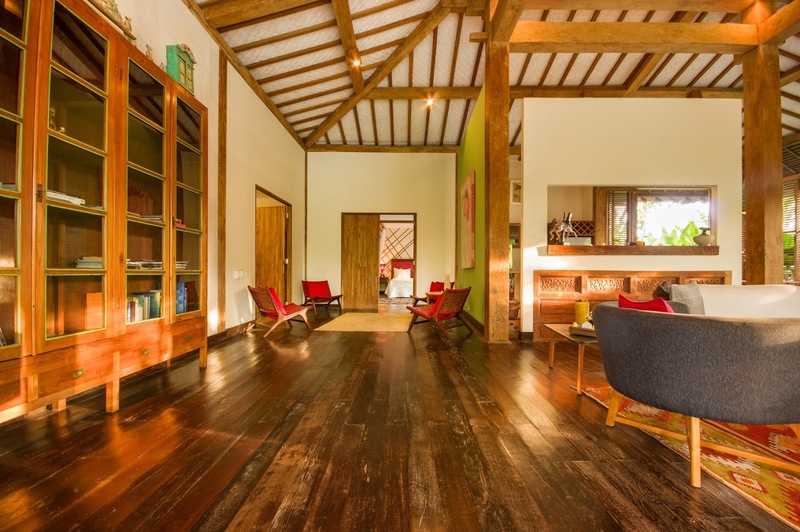 There are armchairs and drawers in the rooms, again rustic and vintage-looking. 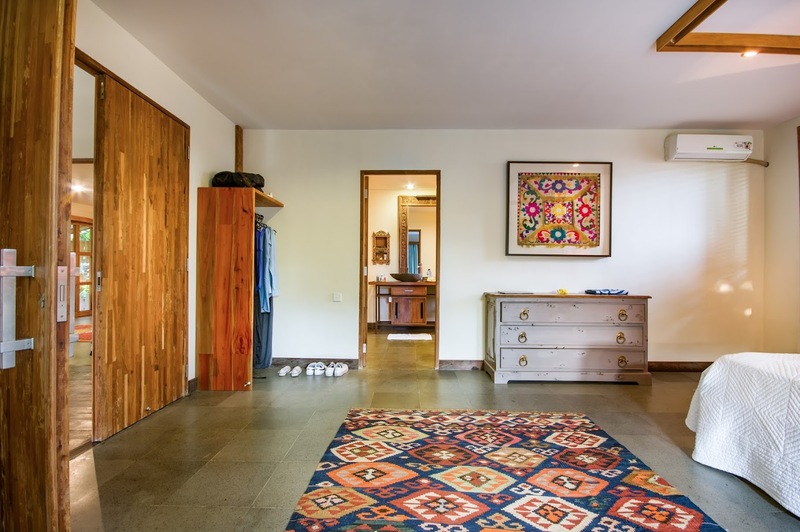 The doors to the rooms are equally gorgeous as they are made from handcrafted wood. 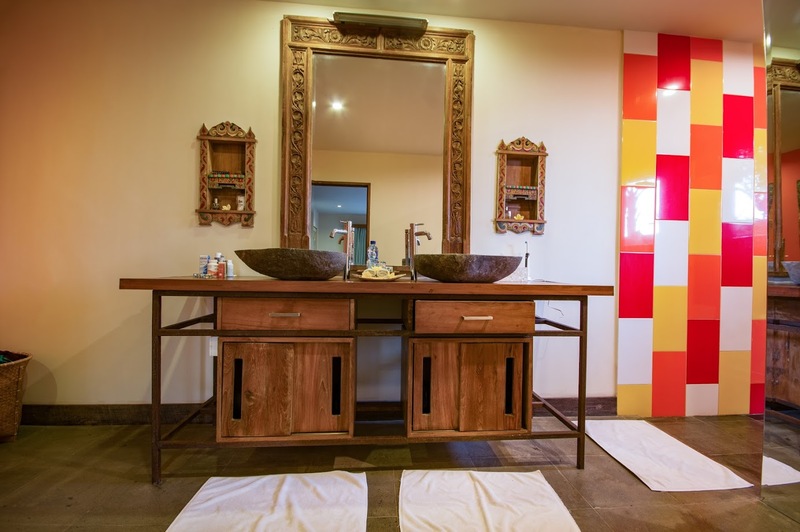 Each bedroom comes with an opulent and spacious en-suite bathroom as well. 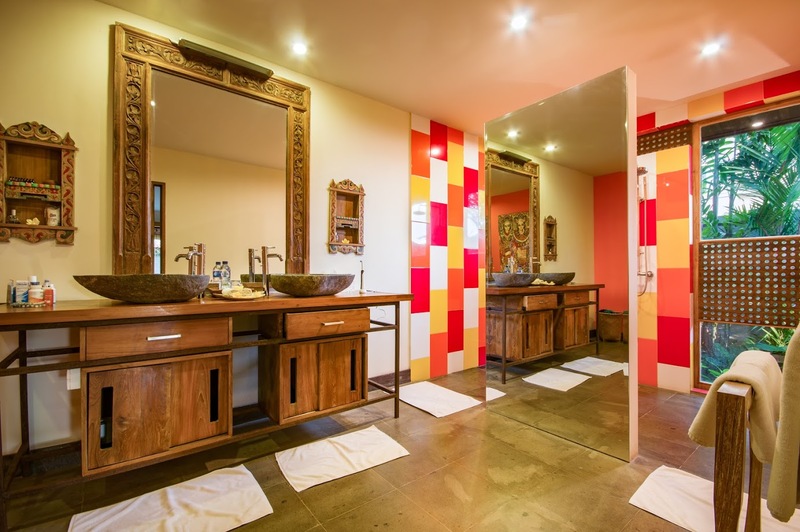 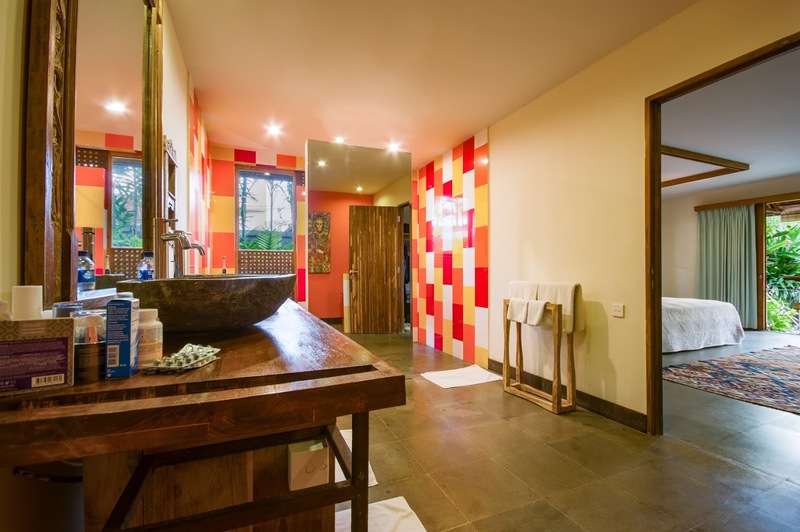 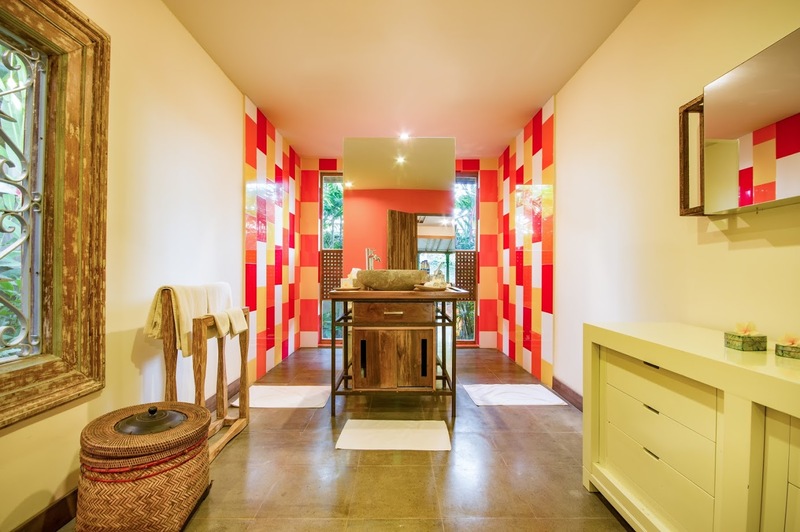 Natural stone basins, decorative shower walls, mirror separated bathing areas are only some of the remarkable features of the bathrooms. 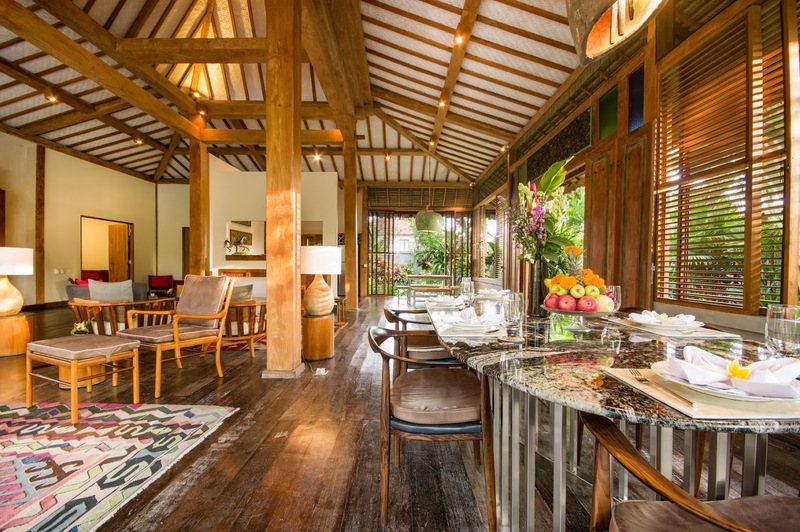 The wonderful staff at the villa is present to look after the guests without a moment’s delay. 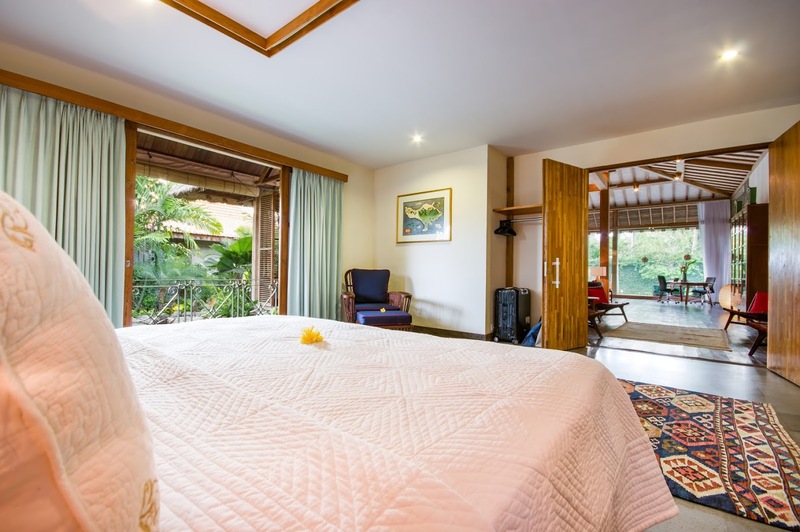 They will happily and readily cater to your needs and their kind nature is sure to bring a smile to your face and make your stay all the more worthwhile. 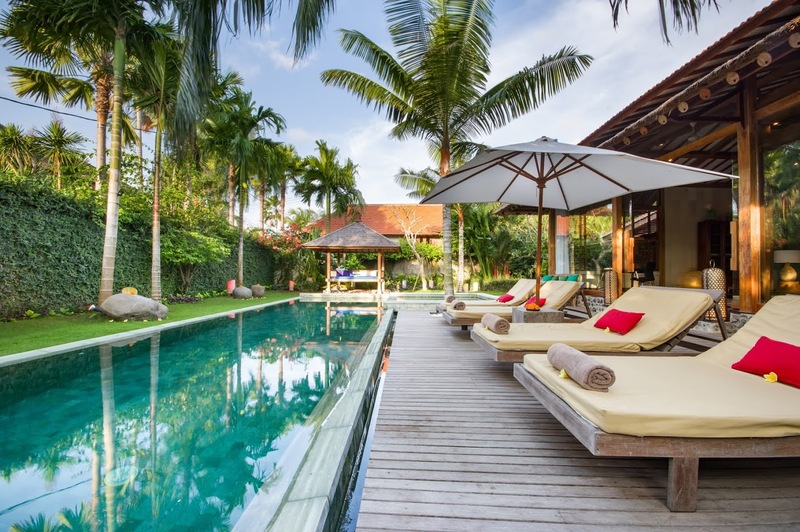 Canggu is usually famous for its tranquility and calm ambiance given its sprawling rice fields, however there is a lot going in terms of nightlife, restaurants and beaches. 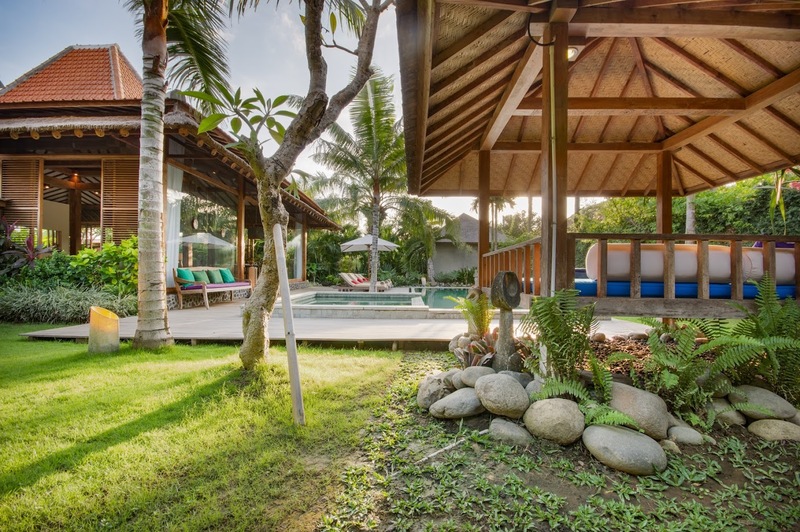 Batu Belig beach and Canggu beach are both close to the villa, where you can sunbathe and go swimming. 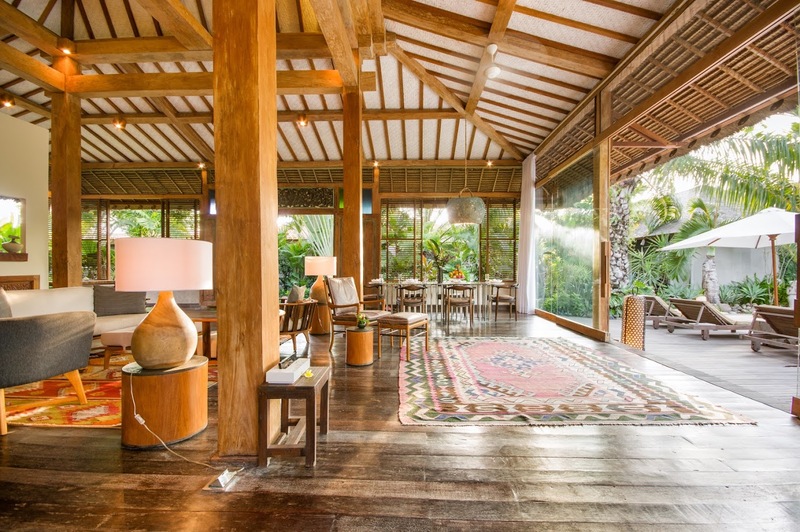 The famous Finn’s Beach Club is also nearby, a great way to end the night and enjoy a few drinks. 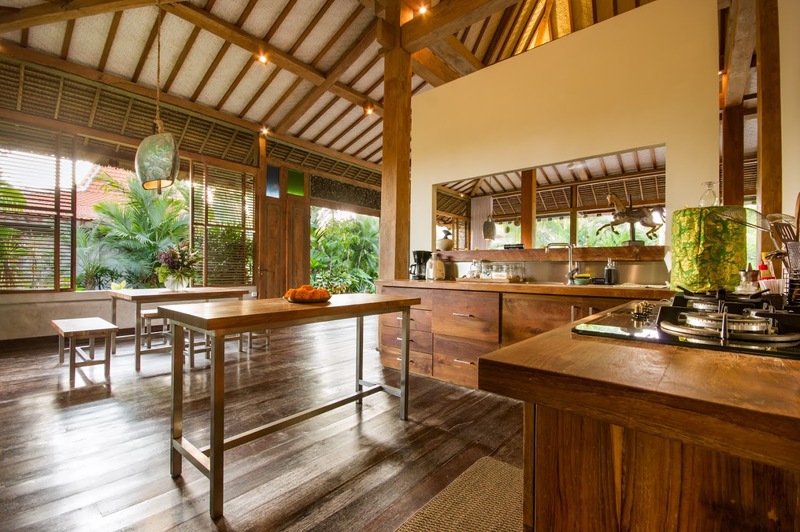 The villa is close to restaurants like Savage Kitchen and many others.